I was reviewing the results of an air conditioning manifold flow analysis in Autodesk Simulation CFD 2013, and noticed there were no traces present. The previous analyses were performed for comparison, had visual traces in the results. The clients would want a consistent style of visual reporting, and so I set out to show the traces. Like Simulation mechanical, once the analysis is performed, traces can be added which instantly show the results. The not so evident part is that these are that they are created as a function of a plane. Planes are easily created in the results environment. Simply enter the Plane Tasks, and pick Add. Once the plane is created, options become available for orienting it as needed. 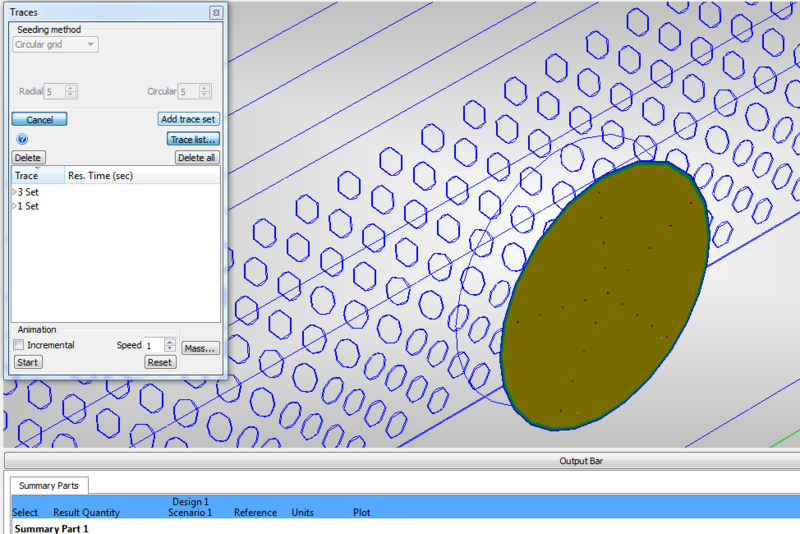 Here I used the align to surface tool activated by picking plane and selecting Align to Surface from the context menu. Then simply picked the inlet plane. The plane then becomes apparent at each inlet. As one or more planes are available, additional features in the Planes Panel of the ribbon activate. This is where our traces come into play. Picking Traces will open a dialog, which catalogs the sets and traces within the scenario. At the top of the dialog is a seeding method pull-down, which includes the options for setting the beginning point (on the plane) of each trace in a set. In this example, I used circular grid since each inlet on the manifold are circular. I created 3 sets, one for each inlet. Once applied, picking Add Trace Set will add the traces to a set, which is cataloged in traces browser, and automatically builds visually through the results model. Once all the sets are created, the properties for selections of traces can easily be accessed and altered. Numerous properties are available to alter, but the two most evident are shape and size, which again can be configured however you need. 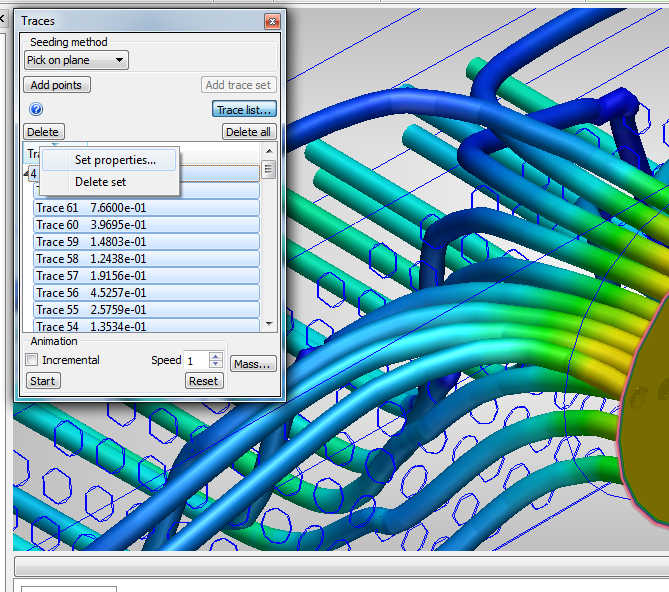 The Simulation CFD interface was very easy to understand once I determined that traces were part of the plane tool-set. I hope this helps get folks moving with this awesome tool. As you guessed, more CFD articles are on the horizon. Keep checking in for more.